What happened to Hydranal Karl Fischer Reagents? There has been some confusion in the market place when it comes to purchasing Karl Fischer reagents and water standards. Some of you who have traditionally ordered the Hydranal brand from Sigma Aldrich (and it's channel partners and dealers) are discovering now that the Karl Fischer reagents and waters standards are slightly different - If you order them from Sigma Aldrich. The names on the bottles are kind of the same, but not exactly. As many people know Sigma Aldrich for many years handled the Hydranal line of Karl Fischer Reagents and water standards. Recently (within the past year and a half or so), a company called EMD who controls the other Karl Fisher reagent line called Aquastar purchased Sigma Aldrich. As a result of this transaction Sigma Aldrich is now part of another company and is referred to as MilliporeSigma.The Sigma Alrdrich you used to know no longer provides the Hydranal brand but intstead now offers the Aquastar line of Karl Fischer Reagents and water standards. What happened to the Hydranal brand of Karl Fischer reagents? A well-known company called Honeywell purchased and now controls the Hydranal line of Karl Fischer Reagents. You can still order Hydranal brand coulometric Karl Fischer reagents and volumetric Karl Fischer reagents via Honeywell and it's channel partners and distributors. What does this mean to you and how might this effect you? Are these reagents the same? Can I use these reagents interchangeably? As a manufacturer and distributor of coulometric Karl Fischer titrators and volumetric Karl Fischer titrators for many years, we have worked with both the Aquastar and Hydranal brands extensively. We are not here to tell you one is better than the other. We can tell you that different model Karl Fischer titrators seem to work differently depending on the brand of Karl Fischer reagent used. It might simply be an operators familiarity with working with one brand vs. the other or it might be because a specific application just works better with a certain Karl Fischer reagent. Are there any real key chemical differences between Hydranal and Aquastar? 1. Different performance. Yes they do perform differently. 2. Different solvents are used. Example: Aquastar Combititrant is a copy of the old version of Hydranal Composite 5 where there was no 2-Methylimidazole. Without 2-Methylimidazole, you can have reagent crystalization and stability issues. As mentioned above we hope to get some additional information on the Aquastar line so we can share with you their strengths and differences. In the meantime we hope this information has been helpful. If you have any questions or would like to compare the reagents you currently use with the "other" brand just let us know. We can provide a cross reference for all of the Karl Fischer reagents by brand and product. As always, we hope this information is helpful. WHY DO WE CARE ABOUT BROMINE NUMBER AND BROMINE INDEX ANYWAY? The degree of unsaturated hydrogen carbide (Hydrocarbon) in oil and petroleum products is indicated by Bromine number or index. Hydrocarbons containing between 6 and 10 carbon molecules are the primary components of most fuels where the process of burning them produces energy. Saturated hydrocarbons are defined by molecular structure and are defined as Alkanes. Alkanes are the basis for petroleum fuels. Unsaturated hydrocarbons are also defined by their molecular structure and produce less energy when burned than do saturated hydrocarbons. Mathematically it therefore requires a greater quantity of unsaturated hydrocarbons to be burned to equal the same amount of energy produced by burning the same amount of saturated hydrocarbons. An un-friendly environmental side effect of burning hydrocarbons is the creation of carbon dioxide. So from an environmental standpoint you could say we prefer the lesser of two evils and prefer to burn saturated hydrocarbons vs. unsaturated hydrocarbons. For these reasons alone it would make sense that we would want to measure and quantify these hydrocarbons. 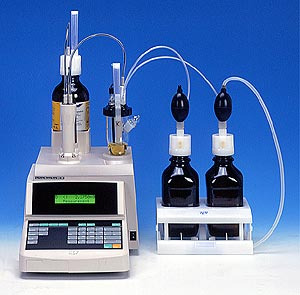 Although the test method ASTM2710 describes the use of an automatic potentiometric titrator the coulometric Karl Fischer method is easier to perform (see ASTMD1492-08e1). Bromine number :The amount of bromine (unit: g/100) consumed in 100g sample. Bromine index :The amount of bromine (unit: mg/100) consumed in 100g sample. When generated bromine is consumed according to Eq. (#1), the electrode detects bromine consumption, and continues generating bromine according to Eq. (#2). Such bromine is generated in proportion to the electricity determined by Faraday’s Law. From Eq. (#1), Bromine reacts with coupled C=C evenly (1:1). ==>Thus, one mol of bromine(159.8g) is equivalent to 2 96500 coulomb, which means 1.2 coulomb/1mgBr2. Based on the above principle, the electricity consumed in electrolysis is converted to the exiting bromine. Replace anolyte and catholyte reagent often (daily). When anolyte turns to white color replace it with new anolyte. Over use of anolyte and catholyte and not replacing it can cause results to be higher than expected. Prepare the reagents and samples for measurement of bromine number and bromine index. Anolyte Reagent: Mixture of Acetic acid (high grade) 600mL; Methanol (high grade) 260mL; 1M-Potassium bromide solution 140mL. Blend it well and use 100mL each time. Catholyte Reagent: 0.2M-Potassium chloride solution. Use 5mL each time. Discharge 20 100μL check solution into the electrolysis cell, and press [Pre-titr. *] key. After pre-titration is finished, press [Sample*] key to enter sample name, its ID and size, and enter the dilution coefficient (D) . Press [MENU/HOME*] to Main display. Press [Start] key, and discharge the sample into the cell. Again press [Start*] key for titration to start. After titration is over, the measurement results appear on display with printout when a printer is connected. *Note that different Karl Fischer Titrator Models will have different button commands. The MKC-710 series coulometric Karl Fischer titrators come standard with pre-programmed setup for running Bromine and follow the above button commands. We hope this information helps you get started. If you have any questions or would like some help please contact us by clicking on the button below. Karl Fischer Glassware and Reagents 101: How to setup. It seems sometimes we overlook the obvious and forget to explain some of the most basic concepts. Sorry about that. 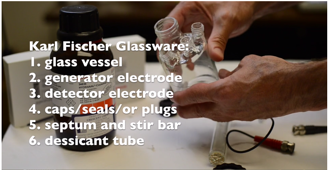 So we thought it might be a good idea to show how Karl Fischer Glassware is setup and how we introduce or "charge" the vessel with reagents. We hope you enjoy this short video tutorial! Sometimes the digital readout says nothing at all. In either case the operator knows something has gone wrong because the Karl Fischer Titrator is no longer giving moisture results. A panic to figure out the problem and get testing underway again becomes the immediate priority. As it turns out “over-titration” is probably one of the top 2 or 3 complaints or issues we hear about from operators. So what is causing this problem to occur? How can we determine the source of this problem, fix it, and more importantly how can we avoid it? This is a critical question for operators and managers working in a production or QC environment who are concerned with keeping their Karl Fischer Titrator 100% “in-service”, day-in and day-out. Having the ability to identify the problem correctly so appropriate measures can be taken quickly is very important. So how do we approach the problem of “over-titration”? By knowing the facts. Having a clear understanding of the process can help operators correct the problem faster when time is of the essence. Over-titration is a state where there is more iodine present in the vessel than water (general definition). When over-titration occurs the vessel will become very dark as a result of the abundance of iodine present inside the vessel. 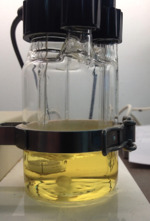 The reagent inside the vessel should normally have a light-yellow color absent a very dark sample such as oil. 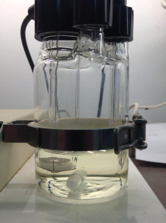 The Karl Fischer Titrator always attempts to maintain an equilibrium where only enough iodine is introduced to counter and neutralize the water present inside the vessel. During a single titration test there should only be enough iodine introduced to counter and neutralize the amount of water present inside the titration vessel during that test – no more, no less. Any incident that interferes with the final amount of iodine introduced during the titration test can lead to dis-equilibrium and result in more iodine being introduced than necessary. Detector Electrode (coulometric and volumetric) - The detector electrode has a sole purpose and probably the most important role in continuously monitoring and determining the conductivity levels within the titration vessel. So what are the causes that can lead to over-titration? Since coulometric and volumetric Karl Fischer Titrators handle the delivery of iodine differently it’s worth describing the two methods separately. In a coulometric system the reagent is a complete system where it is designed to release iodine when the generator electrode delivers an electrical current to it. So what causes the generator electrode to deliver too much current causing the over production of iodine? Another way to say it is, “who or what” is telling the generator electrode to continue to generate a current when it’s not needed? The detector electrode! So why would the detector electrode do this? Without getting into too much of the electronics the detector electrode is designed to “detect” conductivity in the vessel. 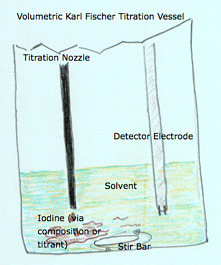 Depending on the amount of conductivity detected the detector electrode will send a message to the titrator telling it to continue producing a current - enough to release the appropriate amount of iodine to counter and neutralize the water present in the vessel. As long as this process is working during a titration an eventual endpoint will be found and a result will be produced. So it’s really a problem of misinformation. If the Karl Fischer Titrator is not getting the right information from the detector electrode then over-titration is possible. The electrode cable. If the cable becomes cracked or breaks it can cause a situation where the message to the titrator is to continue producing a current – continually. In this case the vessel will become very dark and in most cases the titrator will not even know it is in an over-titration state. The generator electrode will simply continue to produce a current, turning the vessel very dark. There will be no other warning or notice from the titrator for the operator to see. Cracked electrode. Sometimes mishandling or even a stirrer bar bouncing around inside the vessel can cause a tiny crack near the bottom of the detector electrode that cannot be seen with the naked eye. These cracks can allow small amounts of reagent inside the electrode enough where errors in detection will begin to occur. What ensues is an unstable drift that jumps around giving the titrator a misreading. The jumping around and unstable drift may be picked up by the titrator and an error stating “OVER TITRATION” may be seen on the screen of the titrator. Cable connectors. Sometimes the connectors on the titrator itself can become dirty, wet and corroded. Also, some electrodes use multi-plug designs that can also become dirty, wet and corroded. These connectors if not clean and dry can lead to a similar misreading similar to a cracked electrode where the drift begins to jump around and become unstable. The titrator may also state that there is “OVER TITRATION” when this occurs. 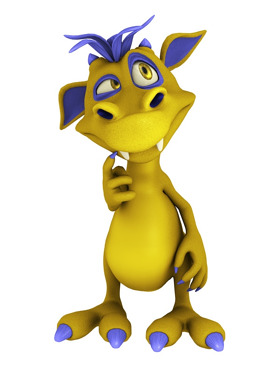 A "Tricked" or "Fooled" Detector Electrode you say? If it’s determined that the problem is not the detector electrode then we need to look at the stirring action inside the vessel. If the iodine being released is not mixing well because the stirrer is off or set too low, then the detector electrode will not realize there is iodine already released inside the vessel. This will cause the detector electrode to continue telling the titrator to produce more current via the generator electrode up to the point where the detector electrode senses a reduction in the conductivity level inside the vessel. Conductivity only reduces as the iodine interacts with the water. So it is important for the detector electrode to sense the true and most accurate “mix or state” of iodine and water during the titration process. If it does not know the true state of the mix it will be fooled into telling the titrator to keep going – causing OVER TITRATION. In a volumetric system the reagent setup is different where a composite or titrant is introduced via a burette piston through a titration nozzle. The amount of composite or titrant delivered is based upon the commands of the titrator. The command from the titrator to the burette and piston that push out the “iodine” through the titration nozzle is, yes, given by the detector electrode. For the purposes of this discussion the difference between the coulometric and volumetric setup is that the delivery of iodine is different. 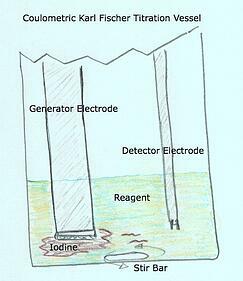 But the same problem can occur where the iodine does not mix well and therefore trick the detector electrode in to thinking there is not enough iodine present inside the vessel to counter and neutralize the water. Since both coulometric and volumetric Karl Fischer Titrators use detector electrodes the problems mentioned earlier about the detector electrode will hold true with volumetric titrators also. 1. Don’t abuse the detector electrode! Be very careful with the detector electrode and do not handle it unnecessarily. Small bumps (clanks) here and there can lead to a crack. Do you really need to remove the detector electrode from the vessel all the time? 2. Don’t turn up the titrator’s stirrer speed to high. This will only cause the stirrer bar to bounce around uncontrollably and possibly hit and damage the detector electrode (crack). 3. Do inspect all connections and connectors on the detector electrode cable and Karl Fischer Titrator to ensure they are dry and clean. 4. Do be careful with the detector electrode cable. Try not to bend it unnecessarily. 5. Do make sure there is enough stirring action inside the vessel to mix the iodine around effectively. A small vortex should be visible. But not too fast to cause the stir bar to bounce around. 6. 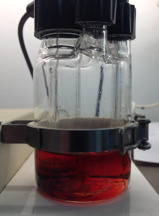 Do introduce some moisture - Sometimes when you are in an over-titration situation and the vessel is already very dark you can introduce a little moisture to bring the vessel back to equilibrium. This sometimes works and immediately the vessel turns from a dark burnt-red color to a light-yellow. 7. Do have a spare detector electrode on hand. 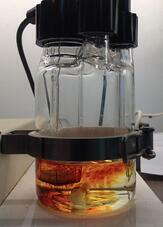 This little electrode seems to get over looked but plays a huge role inside the Karl Fischer Titrator vessel. Most operators who measure moisture using a Volumetric Karl Fischer Titrator tend to have difficulty in 3 areas. Unlike Coulometric Karl Fischer Titrators where the equipment setup and reagents are fairly straight forward, Volumetric Karl Fischer Titrators differ greatly. Understanding how a Volumetric Karl Fischer Titrator differs and how the equipment functions is not only paramount in terms of knowing how to operate the instrument it is critical if you want to obtain accurate and repeatable results. What REAGENTS should I use for testing my samples? Titrants, Composites, Solvents? "TITER VALUE" ..Who, What, Where, Why and How? "SAMPLE SIZE" ..How much do I need or should I use? Although these 3 areas at first may seem problematic and unrelated they are not. In this 9-minute presentation we will explain why the burette size matters, how to calculate a correct sample size and explain how the volumetric titrator reagent strengths work. Tying all three areas together will hopefully not only clear up some of the mysteries surrounding Volumetric Karl Fischer Titration but also empower operators with choices for conducting tests under varied conditions. And, oh yes, obtain accurate and repeatable results every time.